This classic, gold frame is 1 1/4" wide with an overall size of 13 1/4" x 16 1/4". 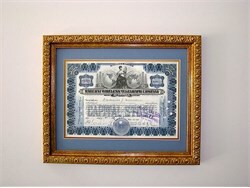 Archival mounting, acid free backing, and clear glass are used in preparing your custom framed Marconi certificate. The cost includes everything including heavy duty packaging and USPS priority insured mailing in the continental United States. Mailing to Alaska, Hawaii, and international destinations is available at actual cost. Beautifully engraved certificate from the Marconi Wireless Telegraph Company dated 1914. 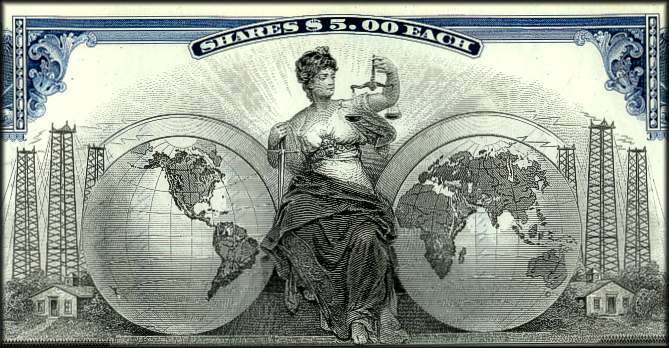 This historic document was printed by the American Banknote Company and has an ornate border around it with a vignette of an allegorical woman holding a balance scale in front of two globes with telegraph transmission towers in the background. This item has the printed signatures of the Company�s President and Secretary. Guglielmo Marconi sent the first wireless message over 100 years ago. Marconi�s first aim in perfecting communication without wires had been to break the isolation of those at sea. The first life-saving possibilities of wireless were realised in 1899 when a wireless message was received from the East Goodwin lightship - which had been equipped with Marconi wireless apparatus. It had been rammed in dense fog by a steamship R.F. Matthews. A request was made for the assistance of a lifeboat. In January 1909, over 1,700 people were rescued at sea when the S.S. Republic was in collision with an Italian steamer, the Florida in thick fog off the US East Coast. For two days in freezing conditions Jack Binns, the Marconi radio operator aboard the Republic, sent out a total of two hundred messages to help guide rescuing ships to his stricken vessel�s position. Thanks to his messages, all but those passengers killed by the initial impact were rescued. Binns received a special medal for his services and Marconi himself presented him with a gold watch.